Tom Seaton was not the best pitcher of the Deadball Era. However, he was one of the game's best pitchers in 1913. He was also was one of baseball's most discussed players, both on and off the field for a couple of seasons. Seaton was born on August 30, 1887, in Blair, Nebraska, about 20 miles north of Omaha. Both his parents died when he was a boy. Seaton went west in 1905 to Point Richmond, California, working at a Standard Oil Company supply depot. He developed his pitching skills on weekends, pitching for the local Richmond team on Saturdays and Sundays. Seaton showed enough promise to be signed by the 1908 Oakland Commuters. The Commuters finished the 1908 season with a 4-71 record in the California State League. Oakland released Seaton after only three appearances because of lack of control. He was impressive enough in the "bush" leagues around San Francisco that winter to be noticed by the Portland club of the Pacific Coast League. The Beavers signed Seaton for the 1909 season. Judge Walter McCredie, Portland's owner, planned to bring continuous baseball to Portland in 1909. His Beavers would represent Portland in the Pacific Coast League, and his new team, the Portland Colts, would play in the Northwestern League, and serve as a farm club for the Beavers. Although McCredie felt Seaton had potential to help the Beavers, he was originally signed to pitch for the Colts. Seaton did pitch in 12 games for the Beavers before the start of, and at the end of, the Northwestern League season, finishing 4-3, but his main work came with the Northwestern League team. With the Colts, Seaton appeared in 37 games, and finished 17-14. Seaton was promoted to the Pacific Coast League Beavers for the 1910 season. He teamed with Gene Krapp, Jack Graney, Bill Steen and Vean Gregg to give the Beavers the most formidable pitching staff in the league. Seaton was 17-17 in 52 games. Portland won the Pacific Coast League championship in 1910, and again in 1911. Graney joined the Cleveland Naps during the 1910 season. Gregg and Krapp followed to Cleveland for the 1911 American League season. Seaton teamed with Steen, Elmer Koestner and Ben Henderson to again dominate PCL batters in 1911. Seaton threw 382 innings for the Beavers, finishing 24-16. He was drafted by the National League Philadelphia Phillies for the 1912 season. Seaton arrived at the Phillies training camp at Hot Springs, Arkansas, in the spring of 1912 in pretty good shape. That was a good thing, since cool and wet weather made it difficult for returnees like Grover Cleveland Alexander, Earl Moore and George Chalmers to get ready for the season. Seaton made the Phillies roster. He struggled early in the season, with his record falling to 4-9 by late June. He finished strong, however, going 7-1 in the final five weeks of the season to finish the season 16-12. The 1913 season was a breakout year for Seaton. He emerged as one of the top pitchers in the National League, appearing in 52 games, compiling a 27-12 record in 322 innings. He led the National League in wins, innings and strikeouts. Seaton's initial win was the first game ever played at Ebbets Field, allowing the Superbas six hits and winning 1-0 in 37-degree weather on April 9, 1913. Despite his success in 1912, Seaton began to experience arm difficulties, complaining of arm pain during a 7-0 win at St. Louis on June 13. Manager Red Dooin rested him for a week in early July. The biggest game of the year for Seaton occurred in Chicago on August 7, while Seaton took the mound against the Cubs. His wife Rene was in labor and in danger of losing her life. Seaton pitched seven innings that day and lost, 5-2. He immediately returned to Philadelphia. Seaton's child had already died, and doctors gave Rene no hope of survival. Rene did survive. She harbored a grudge against the Phillies and Dooin, whom she felt kept her husband from rushing to her side. According to newspaper accounts, Dooin withheld a telegram from Seaton urging the pitcher to hurry to Philadelphia to be with his wife. Dooin denied it, maintaining that he had given Seaton the telegram before the game and that Seaton had insisted that he pitch the game and leave after the contest. Mrs. Seaton did not believe Dooin. When the time came to pay back the Phillies, Rene Seaton was ready. The Federal League planned to compete with the established major leagues for the 1914 season. It had no intention of placing a team in the New York area until the Toronto franchise was relocated to Brooklyn in February under the ownership of bakery magnate Robert B. Ward. Ward gave Federal League President James Gilmore a check for $25,000 and told Gilmore to find him a manager and player. Almost the entire sum was used on one player, Tom Seaton. On February 18, Seaton signed a three-year contract to play for Ward's Federal League team in Brooklyn. He would receive $7,000 per year, along with a $5,000 advance. The Phillies complained that they had a verbal agreement with Seaton to pay the pitcher in excess of $6,000 for the 1913 season. Seaton claimed, however, that a portion of the Phillies' offer was a bonus contingent upon him appearing in at least 35 games and winning 60 percent of his decisions. When the Federal League appeared with an offer for more money, Mrs. Seaton reminded her husband about how she had been "wronged" by manager Dooin and the Phillies. She insisted that he sign with the Feds. But the Seaton saga was not over yet. It was announced in February that Seaton had signed with the Brooklyn club. Still, he reported to spring training in Shreveport, Louisiana, with the Chicago Federals. Both the Brooklyn and Chicago teams downplayed this unusual act, stating that Seaton just wanted some time with his former Phillies teammate, pitcher Ad Brennan, who had signed with Chicago. As spring training progressed, Seaton remained in Shreveport. He finally announced that he "...would play for Chicago or not at all." Chicago attempted to make a deal for Seaton, offering pitcher Claude Hendrix even up for Seaton, and offering another deal involving outfielder Cad Coles and three other players. Brooklyn ownership was determined that Seaton would play for them. He eventually agreed after Ward agreed to increase Seaton's salary to $8,500 a year for three years, and pay Mrs. Seaton's expenses as she traveled with her husband on the road. Seaton finally joined the Tip-Tops in early April of 1914. He pitched their first Federal League game, allowing four hits as Brooklyn edged Pittsburgh, 1-0, in a 10-inning game at Exposition Park. He also pitched in the first Tip-Tops home game at remodeled Washington Park on May 11. He lost to Howie Camnitz and the Pittsburgh Rebels, 2-0. Seaton was 25-14 for the Tip-Tops in 1914. He was in the top five in wins, strikeouts, complete games, shutouts and winning percentage. Between 1911 and 1914, Seaton pitched 1,262 innings. That work was too much. Seaton was a big man for his day, standing six feet tall and weighing 175 pounds. Although he could throw hard, he was primarily a breaking ball pitcher, throwing a wide, sweeping curveball which was sometimes hard to control. All of those breaking pitches in all of those innings took their toll. In August of 1914, Seaton visited arm specialist Bonesetter Reese, who advised a good rest. Seaton sat out two weeks of the season in late August and early September. He still made ten starts in the final month of the season. Nonetheless, the Tip-Tops expected Seaton to be their top pitcher again in 1915. It was not to be. Seaton struggled going12-11 in 32 games with the Tip-Tops when he was dealt to the Newark. Seaton finished a combined 14-17 with the two New York area teams. When the Federal League folded after the 1915 season, Seaton was available to any major league team. Newark owner Harry Sinclair had assumed control of all outstanding Federal League contracts. He sold Seaton's contract to the Chicago Cubs for $7,500. Seaton's three-year deal with the Federal League still had one more year to run. He was persuaded to void the clause allowing his wife to travel with him at the team's expense. He reported to the Cubs training camp in Tampa. 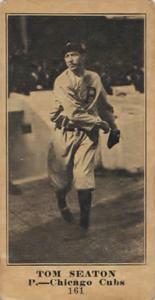 Seaton was a spot starter and reliever for the 1916 Cubs, finishing 5-6 with a 3.27 ERA. He often pitched better than that record would indicate. In his first Cubs appearance on April 15, he lost a complete game two-hitter at Cincinnati. He also pitched in the Cubs' first game at Weeghman Field, striking out the Reds' Bill Louden with the bases loaded and two out in the seventh inning. By 1917, however, Seaton's arm was growing weaker. Despite a 5-4 record and a 2.53 ERA in 16 games, Seaton was dealt during the season to Los Angeles of the Pacific Coast League. Seaton pitched for 22 games for the Angels in 1917. He then threw for San Francisco for the next three seasons. He had a stellar season with the Seals in 1919, winning 25 and losing 16 with an ERA of 2.84 in 354 innings. As the 1920 season began, trouble was brewing for Seaton. During his baseball career, Seaton had apparently earned himself a reputation as a less than honest character. In the wake of the Black Sox scandal of 1919, the Pacific Coast League targeted several players who were considered undesirable for the league. Seaton was one of them. After pitching in ten games for the Seals, Seaton and fellow Seals pitcher Luther "Casey" Smith were released in May of 1920. Seals President Charles Graham cited rumors "...regarding the practices of the players (Seaton and Smith) and their associates." Seaton then signed with the Manford team in the industrial San Joaquin Valley League. After pitching three games, he was released when the Manford club was told it would be thrown out of the league if Seaton continued to play. Seaton then attempted a return to organized baseball by joining Smith with Little Rock in the Southern League. Southern League President, John Martin refused to approve the contracts, citing their questionable conduct in the Pacific Coast League. Little Rock attempted to use Seaton and Smith. But several teams in the Southern League announced that they would not play Little Rock if these two players were on the roster. Despite the promise of investigations and possible lawsuits, Seaton instead accepted lucrative offers to play industrial ball. Seaton reappeared in baseball in 1922, as a pitcher and possible manager for a team in Poplar Bluff, Missouri. He then moved to the Southwest, and for the next five years played for teams in Tucson, Juarez, Bisbee, and El Paso in the Arizona State and the Frontier Leagues. Seaton finally settled permanently in El Paso, continuing to pitch semi-pro ball for several years after 1927. He also earned a reputation as one of the top bowlers in El Paso while working as a foreman for a smelting company. Seaton lived in El Paso for the last 19 years of his life. He died of lung cancer on April 10, 1940. He was buried in Evergreen Park Cemetery. Various issues of the Blair (Nebraska) Pilot-Tribune, Chicago Tribune, New York Times, Philadelphia Inquirer, Portland Oregonian, Sporting Life, and Sporting News. Ginsburg, Daniel E. The Fix Is In. Jefferson, North Carolina: McFarland, 1995. Snelling, Dennis. The Pacific Coast League: A Statistical History, 1903-1957. Jefferson, North Carolina: McFarland, 1995.